Sara’s Bakery | Que Sera Sara? Autumn always means a hunkering down in my world; a little domesticity and coziness as the evenings lengthen and the light fades. In the last month I have possibly done more baking than I have in all the rest of the year put together. Let’s pretend it’s practice for Christmas instead of a sugary-carb overload to stave off the darkness. Either way, it’s been freaking delicious. A brilliant way to use up the lingering remains of the gargantuan courgettes yielded by our Indian Summer (and these are so cheesy!). I skipped the sultanas, and next time I’d dry the courgette shavings on paper towel [they can make the muffins moist to the very edge of soggy] but savoury muffins are a new and very welcome addition to my kitchen. 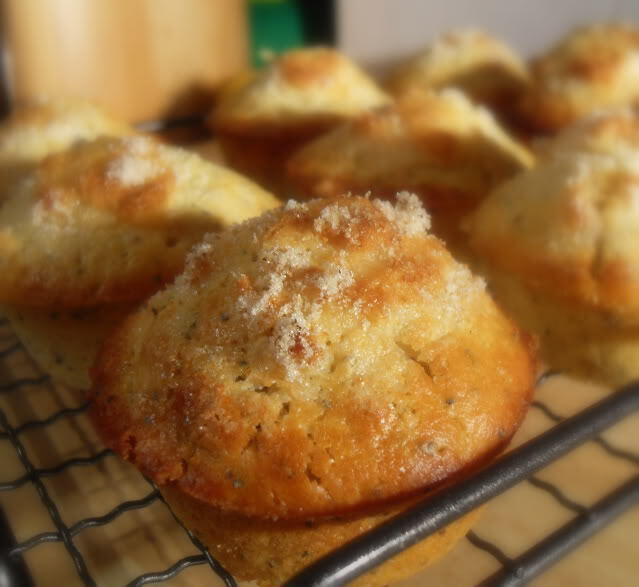 About once a year I make lemon poppyseed muffins, everytime with a different recipe. I have yet to find a runaway winner. This one was very fluffy – and bonus: I didn’t need yogurt or buttermilk. I never have these things in the house and it is a nuisance to buy a whole tub only to put a tablespoon or two in a recipe. I love this bread. I make it all the time. No prep and hardly any effort, a large soda bread round is the breakfast of kings. However my mild walnut allergy is getting worse, so two days of mouth ulcers hardly outweigh ten minutes of delectation. most of the time. Having the walnut debacle, I challenged myself to reinvent the recipe above with a new palate. I kept everything the same, but replaced the walnuts with 2 handfuls of raw oats and 1 handful of dried cranberries. It is a worthy successor, though it’s definitely dessert breakfast. 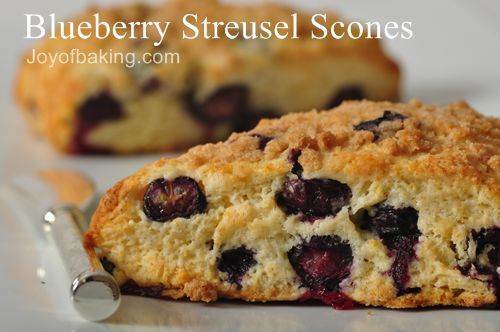 A scone can be so tempting, so perfect. All that buttery sweet/savoury fluffiness. Shame about all that rubbing. I’d make them everyday if it wasn’t for all the time I’d have to spend digging crumbly mixture out from under my fingernails afterward. totally unglamourous. Though I will say these ones are so worth it. I’d never streuseled a scone, but now I think about it, a crispy brown sugar & cinnamon rub probably should go on everything. I’ll admit it. Cookie bowl is a weak spot. For real. Last year a friend posted a link to a recipe for making a skillet cookie on facebook. But this, this was something else entirely. 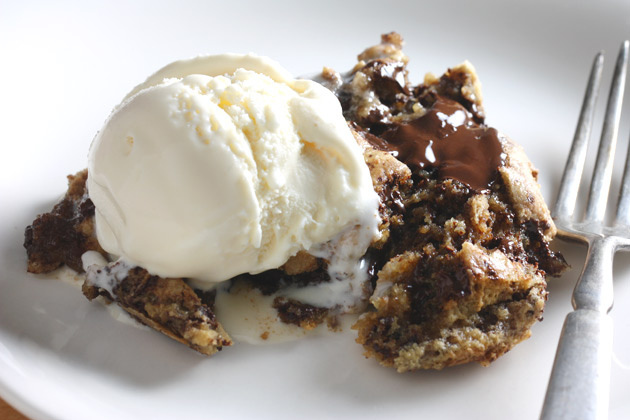 This was one gooey cookie dough mess, made for eating straight from the bowl. I haven’t made the recipe since I tried it (though it was totally worth it, if a bit heavy on the chocolate chunk for my taste), now I bake by eye. While it’s not the same rich indulgence (and can go awry) this means I can improvise based on what’s in my cupboards when an 11pm craving hits. Also means I can make it in about 30 seconds. These are the survival skills I feel will serve me well when the zombie apocalypse comes. A bland, rather nothing soda bread, but a handy one to have a round until I can concoct better. You don’t have to use buttermilk, in a pinch I’ve used half-milk half-water, but be sure and poke plenty of holes in the dough to get the maximum rise out of it, and add an extra tsp baking powder if in doubt. Recently I made the dough but used half corn meal and half flour, and plopped dollops of it a greased muffin tin for soda bread dinner rolls. They were rather excellent with stew f I do say so myself. This is the only entry where the photo isn’t from the recipe. 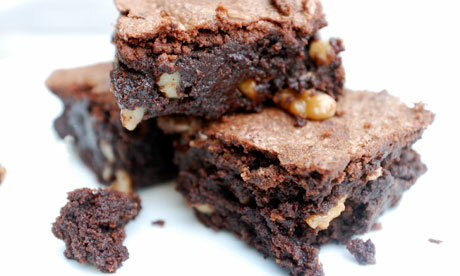 In this case, I bow down to Felicity’s Brownie Breakdown in the Guardian. She is a girl after my own heart. Now, I found this recipe posted on a message board. It was attributed to Nigella’s How to Be a Domestic Goddess. I’ve not read it, so I can’t be sure, but it sure is fudgey goodness in a pan. And if the Guardian uses that as research, I think I’m allowed some liberality of citation too. A tasty simple tea time treat. I rarely bother to zest a lemon, just add a few shakes of juice from the bottle. I’m lazy. Sue me. Peanut Brittle is a family institution at Christmas and will someday be deserving of its post con recipe. I’ve never made candy before but if I was to start anywhere, my great grandmother’s recipe was the place. It was really simple, but mine was a little over done. Now it has a burnt toffee aftertaste which I’m not fond of, but Bean loves it. In hindsight, using Golden Syrup instead of Corn Syrup probably changes the boiling point. Significantly. Still, I think I’ll get the hang of it – and bonus: I avoided having to source corn syrup without high fructose components. 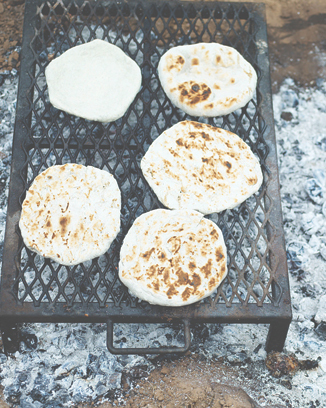 Think naan-fluffy, tortilla-dense bread sheets. Delicious. Not as easy as his recipe makes them sound, but tasty as anything when you have the 15 minutes to spare. I used about twice as much water than it says to get them properly fluffy, it was hellish to knead otherwise, but that aside, olive oil flavoured bread the size of my face is something I’ll rarely turn down. Another baking mad adventure. Take the walnut bread recipe, replace the water with apple juice. Halve the quantity of honey. Add only a handful of rough walnuts [surely one or two can’t do much damage I thought…], plus a handful of currants. Put that scone streusel on top for good measure. While I am recent convert to Alton Brown’s outstanding chocolate chip cookies, they are a lot of work. Yes, beating the eggs makes them fluffier. 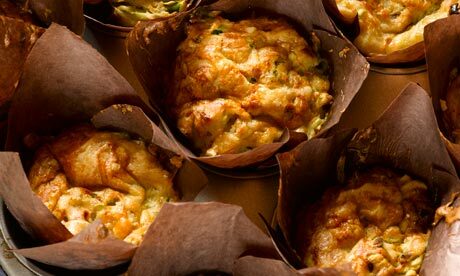 Yes, storing the batter overnight helps them rise beautifully. Yes, bread flour is truly inspired. But sometimes I just want good old-fashioned, easy peasy cookie action. And I turn to my friend Jennie’s tried and true recipe. The one she would make when I was ill or hung over in college [and then she’d tactfully look the other way when I’d eat most of the dough before she could get them into the oven]. For that alone, they’ll always be favourites. In fact, I have just remembered the rest of the dough in languishing in my fridge. Please excuse me, I have very important business to attend to. 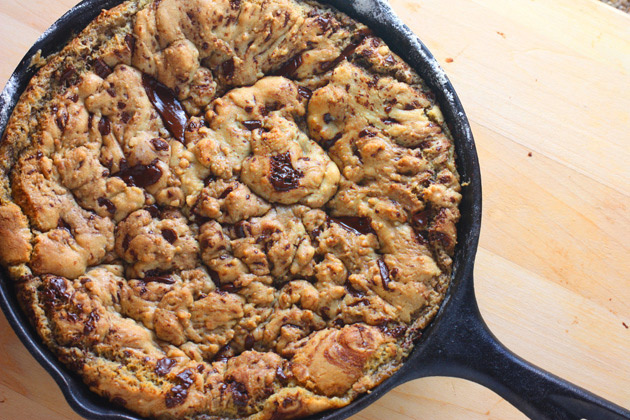 I made a skillet cookie last year and thought. I. would. die. it was so good. Thanks for reminding me! 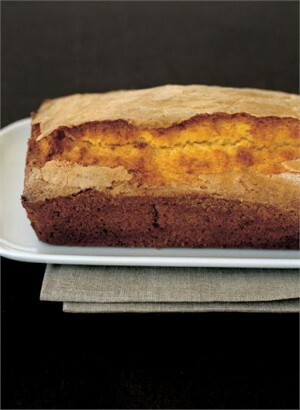 Have you tried Pioneer Woman’s Best Coffee Cake. Ever? It’s stupendous. There’s some work involved, ie the Alton Brown cookies, but it’s worth it. i just stumbled upon here from Joy the Baker and am excited to have a look around. Thanks for posting! Ooh, I have never attempted a coffee cake, perhaps now is the time! 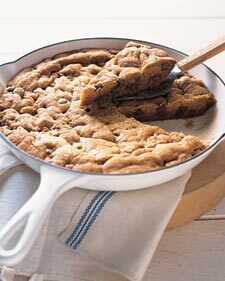 I concur: Skillet cookie = heaven.